Surrounded by an enclave of landed houses, bars and bistros, and blocks of old flats, Siglap Centre is a sleepy neighbourhood mall whose age shows in its decor and array of tenants. It is not a place built for crowds and bustle—there are no cinemas and chain clothing stores, and no cafés dishing up the latest Instagram-worthy drinks or food. It seems like nothing has changed in this mall over the past few decades, with its collection of nail salons, hairdressers, tuition centres, and the odd seamstress or tailor—and then there is Ren Ren Desserts. 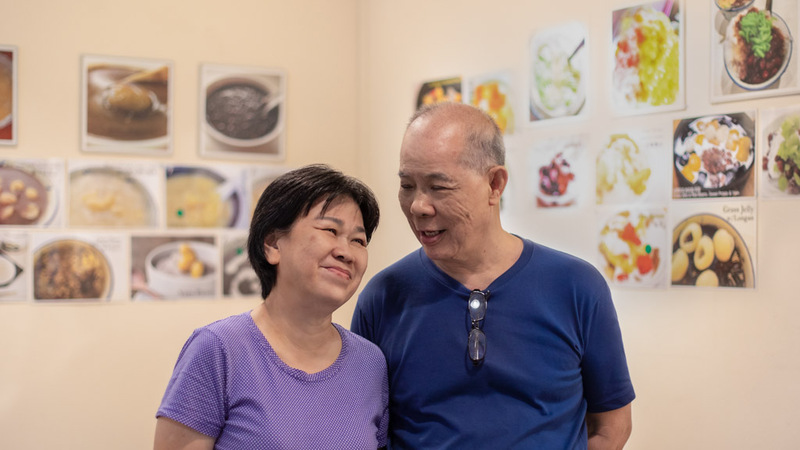 Located in the basement of Siglap Centre, Ren Ren Desserts is run by Mr and Mrs Tang, better known as Wilson and Elsie by their regulars and friends. The shop is homely and no-frills, down to the wooden signboard in black and gold paint and the Chinese and Cantonese oldies playing in the background while they work. 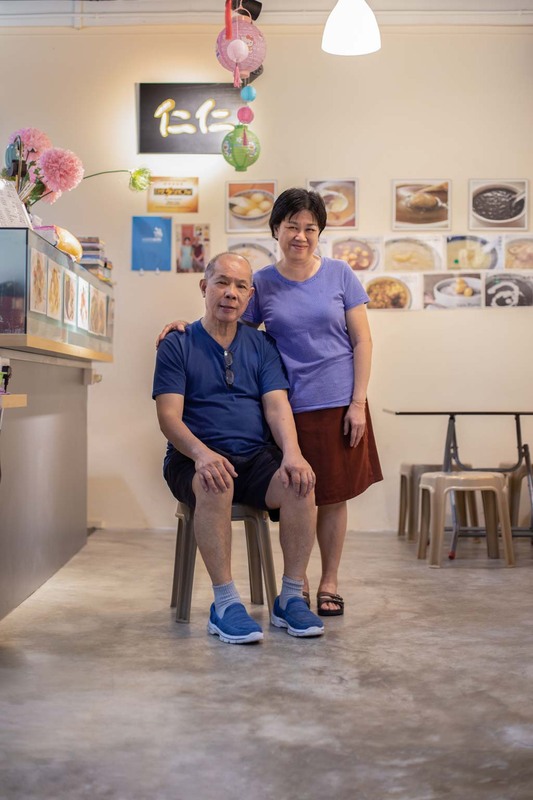 While Uncle Wilson and Auntie Elsie have been here for the past two years, faithfully serving up desserts to a small but loyal clientele, the business has been running for close to two decades. Uncle Wilson’s decision to make desserts was somewhat unexpected. 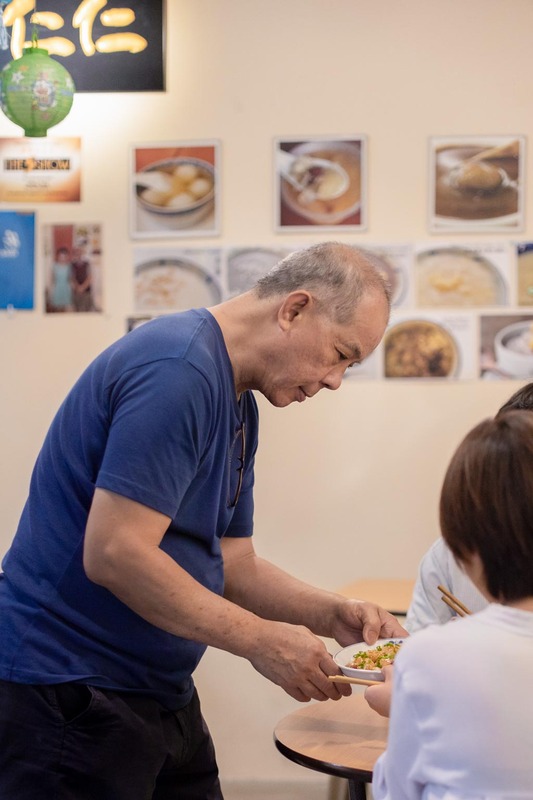 Coming from a family of cooks, he was expected to join the family tze char business, but his training in a catering school, subsequent experience working in Western cuisine, and a love for traditional Chinese desserts led him to open up Ren Ren. 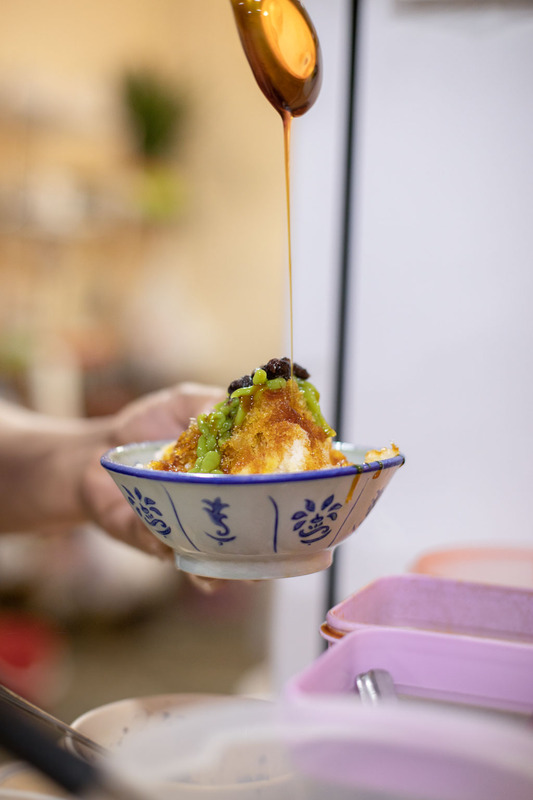 While business was initially brisk when they first started up in Chinatown in 2000, rising costs and poor conditions led them to relocate, by chance eventually settling in Katong, closer to their home in the east. After 10 years at Katong, fatigue and family matters resulted in a brief hiatus before they reopened at their current location in Siglap. Although Ren Ren sells traditional desserts, they are in no way content with stagnation, and are intent on keeping up with the times in whatever ways they can, including setting up a Facebook page for the business and taking opportunities to find new recipes on their frequent trips abroad, and adapt them. Uncle Wilson calls these trips “a mix of work and play”, a way to make time for life in the otherwise endless cycle of work, especially as age catches up with them. When we ask about the things that keep them going, he tells us simply, “It’s something to do, and it’s a way to challenge myself to make something of good taste. There’s a sense of satisfaction when customers enjoy the desserts that we make.” While trendy cafés and food crazes have come and gone over the years, it is this dedication that has kept Ren Ren going strong, slowly and steadily simmering like the pots that sit on their stove. Share with us about the name of the shop. What does Ren Ren mean? Auntie Elsie (E): The word ‘ren’ (仁) refers to nuts and seeds, which are important ingredients to us, like almonds (杏仁) and peanuts (花生仁). It also sounds the same as the word for person (人), so calling the shop that was our wish that this would be a place everyone (人人) would come to. The business has been around for 18 years. What were you doing before this, and why did you decide to change? W: I studied in a catering school, and after that I worked in a hotel, serving Western food. I spent more than 10 years working in the trade, doing almost everything from pastries to salads and mains, which gave me a very good foundation in Western cooking. Together with my family’s background in tze char, that gave me a lot of knowledge and understanding of food and cooking, whether Chinese or Western, and it helped me to better understand what good taste is and how to use and pair ingredients. E: I did administrative work my whole life before then. I was working in accounts, and he persuaded me to join him to run the stall in Chinatown. W: Compared to an office job, a food business would give us more freedom and less politics to deal with, and it was easy to convince her since we both loved food. Uncle, coming from a family of cooks, why did you decide to make desserts instead of cooked foods/tze char? W: I found it very laborious and inefficient—you need a lot of manpower and the hours are long. Tze char is very popular during lunchtime and at dinner, but in between it’s very quiet. I preferred to have something that could be consumed all day long, a good meal to be had while chatting with friends, whether at 2PM or 4PM. 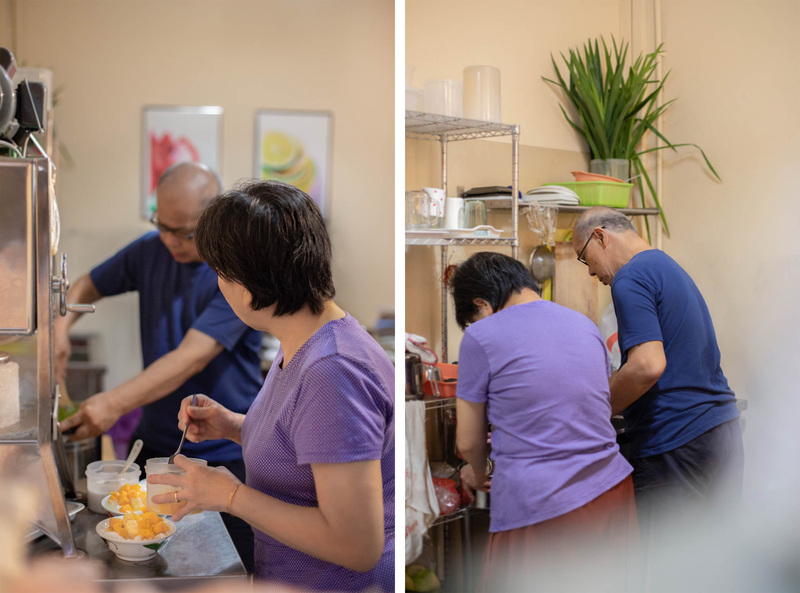 Of course we don’t earn as much as compared to tze char, but desserts are easier to handle—after you’ve prepared them, you just have to keep them warm until they’re ready to serve, and cleaning up and packing up is also easier. 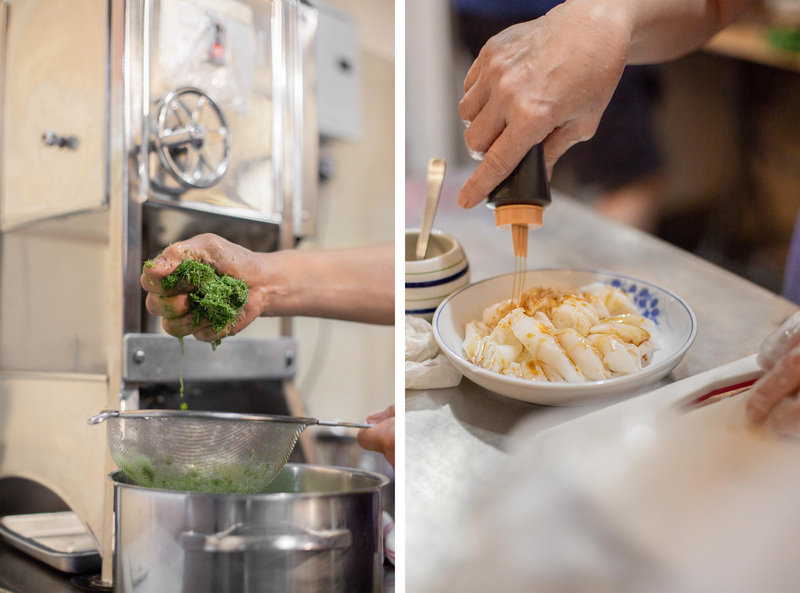 Tze char is a much larger operation, where you need a butcher, a cook, a dishwasher and so on. How did you start to learn how to make desserts? W: We travel to Hong Kong quite often, and we always enjoy the traditional Chinese desserts there, so at some point we tried to figure it out ourselves. My experience helped, but it was still a lot of experimenting and tasting, and of course we made mistakes in the beginning. We would think that business would have been better in Chinatown where there’s more foot traffic, compared to neighbourhood areas like Katong and Siglap. Why did you move from Chinatown to Katong? W: In Chinatown, we were on the first alfresco food street that was set up on Smith Street. There were 18 stalls in the beginning, and it was catered to people who enjoyed outdoor dining. Business was quite good in the beginning because people were keen to come and experience it, but as the years went by the place lost its shine due to the hot weather and rain. There was no shelter over the street then, so when it rained it was very quiet. We only saw a lot of diners on weekends and it was very slow during weekdays. E: By our fourth year there it became difficult to keep up. That was the peak of the SARS outbreak, so most people avoided going outdoors. Our overheads were also adding up, with rental and other fees gradually being raised. We didn’t mind paying more since business was brisk, but as it continued to increase, we had to leave. W: We decided to move to Katong because it was closer to home. While we were on Smith Street, we realised that serving desserts in a hot environment was not very conducive. People don’t enjoy hot desserts under the sun, they prefer chilled desserts. At Katong, the stall was sheltered and air-conditioned and business did very well. E: Another thing was that most people didn’t want to have desserts in the early evening, at around 5 or 6PM. They would be eating proper meals, and they’d only come to us later. So most times, we would have to wait until 8 or 9PM until business really picked up. 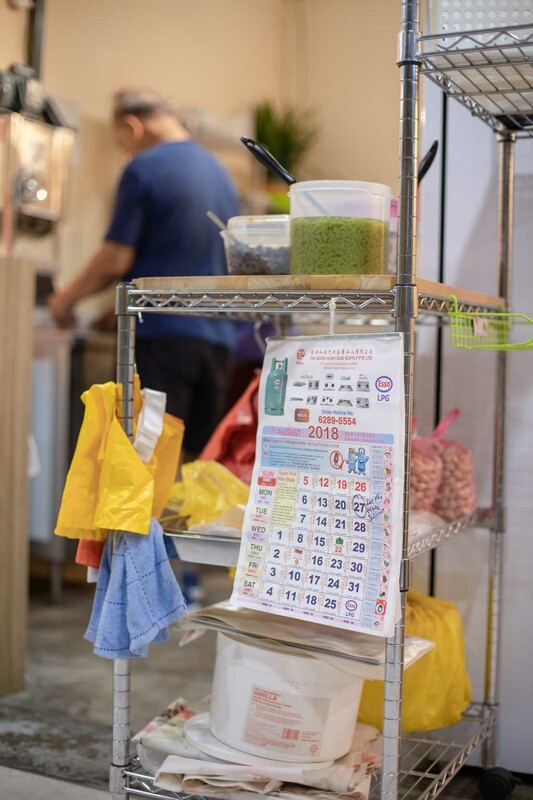 We chanced upon the unit while we were walking about the neighbourhood, and after meeting the landlord we decided to set up the shop in Katong. After Katong, you stopped the business for a time before opening up the Siglap store. How long did you stop for, and why did you decide to continue? W: We spent almost 10 years at Katong, and there came a point when we felt tired and weary. We had domestic helpers then but they were thinking of going back home, and my wife suggested that we retire. Our daughter also had a child on the way then, so we thought it would also be nice to spend time taking care of our grandchild. After some months, my daughter wanted to take care of her baby herself, so we were feeling a little lost with nothing to do. We looked around, and we thought we could start up the business again, this time with a smaller space at a slower pace. W: I couldn’t stand the loneliness and having nothing to do. (laughs) I didn’t want to work for others, so we decided to start up again. Now we’re trying to take it easy. We only open five days a week, and we work shorter hours. We also try to travel more often, twice a year, mainly to China, Hong Kong, and Macau. It’s a chance to work and play for us—now that age is catching up with us, we want to make time for life instead of just working all the time, and it’s also a chance to learn new skills. Has the menu changed over the years? W: The menu has stayed pretty much the same since we were at Katong, but we’ve added some new items over the years. Whenever we travel to Hong Kong or Macau, we try to look for ideas and learn new recipes that we can add to the menu. 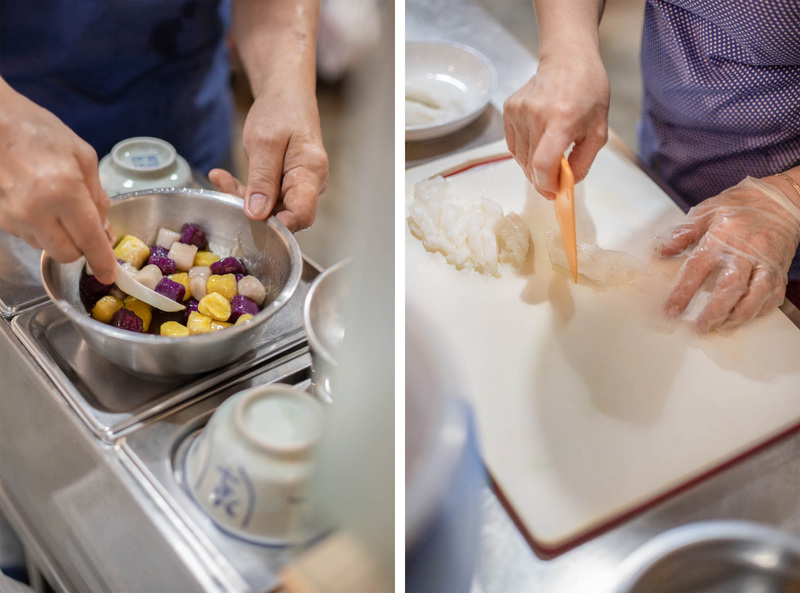 One of the items is the stewed mushrooms that we add on the chee cheong fun, which is very popular with customers. We’ve also started serving fried popcorn chicken–that’s been popular with our younger customers. Share with us what your daily routine is like. W: The preparation work starts the night before, with things like soaking the beans and nuts, and making the jelly for the chendol. I usually get up at 6:30AM to head to the market to pick up fresh ingredients like coconut milk. When I get home I continue with any cooking and boiling that needs to be done, and I’ll head to the store to set up at about 10:30AM. E: I usually wake up later at about 9AM, and I’ll carry on any of the preparation work that he leaves off. 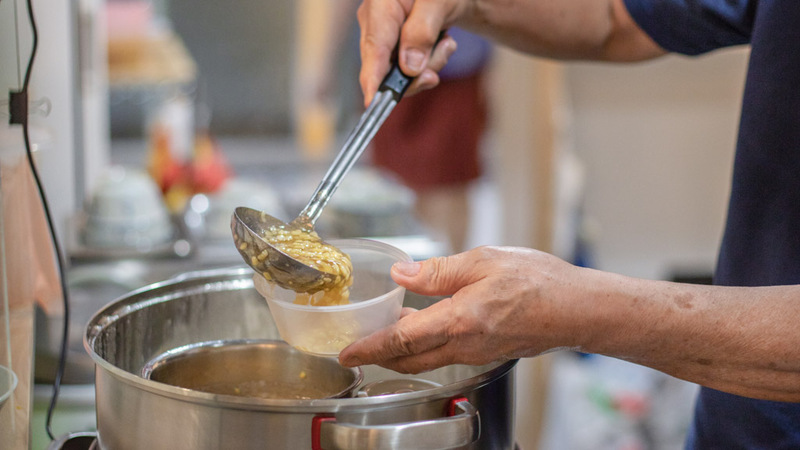 Besides that, I also prepare the cooked food like the yam cake and fried bee hoon, and some of the hot desserts that need to be boiled slowly, like the red bean soup and barley beancurd. I’ll leave for the store at about 12NN, and from there it’s just preparing to open for the day. W: After we close for the day and head home, we’ll spend some time at night preparing for the next day’s business. It’s a continuous process. On our off days we get to sleep in a little later. We’ll have breakfast, and go to wholesale shops to buy ingredients like rock sugar and almonds. Many of your customers have followed you from Katong to Siglap. Have you built relationships with your regular customers? W: Some customers have stayed with us since Katong, or even Chinatown. On weekends they bring their families down, and there’s a sense of nostalgia seeing old friends. There’s also a sense of closeness when you know what they want, and the habits and preferences some of them have. Some people like to have gula melaka (palm sugar) on top of their mango pomelo, and some people don’t like red beans in their chendol. What do you think the appeal of traditional desserts is? W: It’s a different kind of enjoyment from cafés, because it’s a very localised experience. For our middle-aged customers and those who are retired, it’s a nice simple meal or light snack, and we try to make it a family dining experience. For younger people, they like that it offers something different from most cafés and modern dessert places. E: I think it’s because we have something for everyone. Our middle-aged customers come mostly for the hot desserts, and the younger people for the cold desserts, though some of them also do appreciate the traditional desserts. Besides that, we also serve savoury cooked foods for people who want something a little more filling. It makes a difference that we really put effort and heart into preparing the food. We’re sincere and don’t cut corners, and people can sense that. Have you considered passing the business on to your children? W: (laughs) I’ve raised it to them many times but they’re not keen, having seen the preparation work and how we’re working constantly. There’s also not much that technology can do to simplify the process and make the work easier, so I can’t blame them. It’s not something I want to force on them either, since my parents tried to influence me to join their tze char business. E: My nephew was interested, but they didn’t want to take over all the cooking and preparation work. W: To be frank, we’re at the point where we’re thinking of retiring in another year or two. If there’s someone interested in learning how to make the desserts, I’d be glad to teach them and pass it on, and be their consultant. Have you had disagreements because of the business before? How do you balance your marriage with work? W: Of course! (laughs) There have been times where we ended up throwing pots at each other. We’ve had arguments because we couldn’t agree on how a dish should taste. At the end of the day, we both enjoy making desserts, and through the process of learning and working we’ve developed a love for doing it, and having that shared passion comes before our disagreements. E: He’s exaggerating. (laughs) But yes, we’ve argued before because we both insist on how things should be done. It could be about something as small as a garnish or plating. Neither of us want to give in, and we both keep pushing until one of us gets our way. Among your offerings, which of the desserts or dishes are your favourite? W: I’d say it’s the chendol and the fresh mango pomelo, because these are things that we make from scratch. 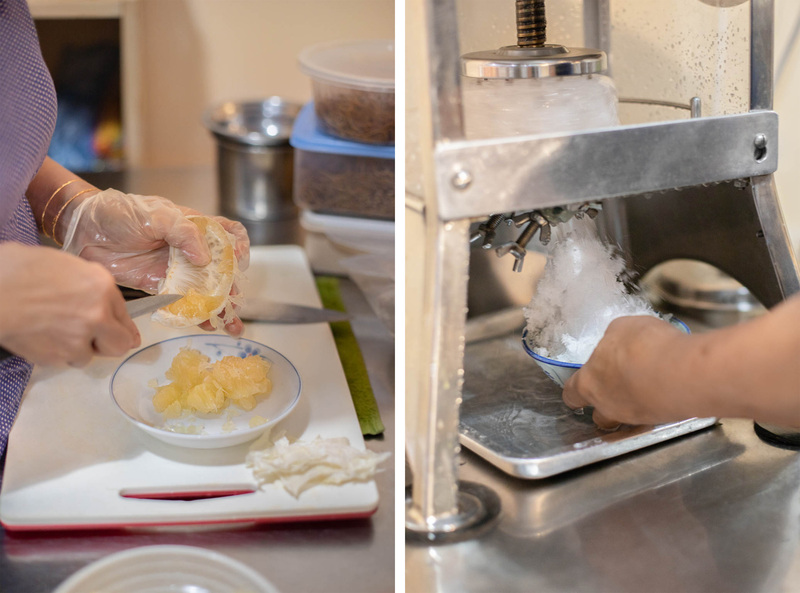 Instead of buying it ready-made, we make the jelly for the chendol by hand, which is something not many people do any more. E: The chendol is my favourite as well, because it brings back childhood memories for me. For the savoury dishes, the bee hoon is my favourite, because it was something I learned to make and wanted to add to the menu. If there’s something I like and want to serve, I’ll put my heart into it and do it the best I can. Opening Hours: 1.30PM to 6.30PM Tuesdays to Thursdays, Saturdays and Sundays, closed on Mondays and Fridays.